After many years of careful planning, we are excited to feature this unique journey for the very first time. 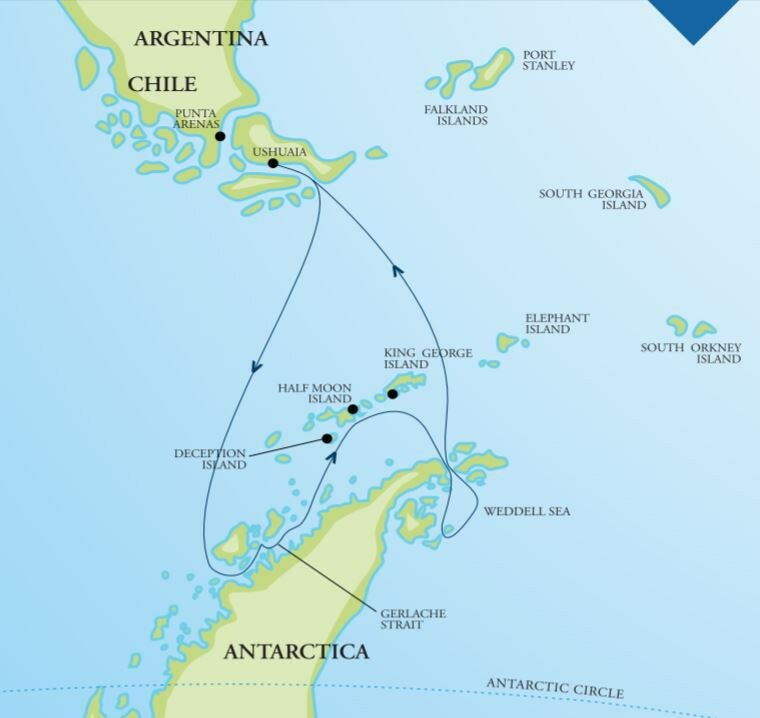 This expedition combines many of the classic and well-known locations along the western side of the Antarctic Peninsula. Yet it also adds a genuine sense of exploration as we enter the icy realms of the Weddell Sea, situated on the less-visited eastern side of the peninsula. It is here the big icebergs roam. The flat-topped tabular bergs, some the size of whole city blocks - break off the vast ice tongues far to the south before drifting north on the ocean currents. Located on deck 3 these cabins feature two lower berths and one upper berth. One lower berth can be converted to a comfortable sofa during the day. Washroom facilities are shared. There is a washbasin in the cabin, a writing desk and chair and ample storage for all cabin occupants. These cabins are efficient and well-appointed with two portholes with the option to open one. One triple cabin is reserved for female guests, the other is for male guests. Triple cabins can also be booked by groups of three travelling together. Located on deck 4 these cabins have two lower berths, one of which can be converted to a sofa during the day. These cabins have tall wardrobes with internal shelving for storage, a writing desk, chair, bookshelf, and a window that can be opened. Facilities are semi-private â meaning you share the washroom with the adjacent cabin. Located on decks 4 and 5 these spacious. Well-appointed cabins feature two lower berths (one which can be converted to a sofa during the day), with private washroom facilities (sink, shower, toilet and bathroom cabinet). There are tall wardrobes with internal shelving for storage, a writing desk, chair, bookshelf, and a window that can be opened. Onboard Akademik Ioffe these very large cabins are located on deck 6, and feature two lower berths, a sofa, writing desk and chair, ample storage and private washroom facilities. All cabins have a window that can be opened. These cabins provide great access to the outer observation decks and shipâs bridge. We chart a southerly course for Antarctica. This stretch of the South Atlantic is rich in its bio-diversity and showcases an abundance of wildlife. We will be joined by hundreds of seabirds including the wandering albatross. Giant petrels and smaller Cape petrels are also constant companions as we make our way south. Photographing these magnificent birds takes patience and skill and our photography expert will be on hand to show you the best techniques. Join the ship’s Captain on the bridge and learn about the operations of our modern research vessel. Throughout the day our onboard experts educate us with a series of presentations about the environment, the wildlife and history of the locations we hope to visit in the coming days. As we approach the coastline of Antarctica, we anticipate an increase in whale sightings. We awaken today, and the magnificent snowy peaks of continental Antarctica are laid out before us. Arriving into Antarctic waters via the Bismark Strait, we aim for some of our favourite landing sites today. Anvers Island is one of the largest of the off-shore ‘barrier’ islands of the Antarctic Peninsula. There are several outstanding sites here and neighbouring Wiencke Island, such as Damoy Point, or Port Lockroy. These locations provide us with our first opportunity to venture on shore, and cruise in the Zodiacs. A short transit across the Gerlache Strait brings us along the actual continental landmass of Antarctica. A shore landing at Paradise Harbour will be a highlight for many – as you step foot on the continent proper, for the first time. An Argentine refuge is located here and the nearby hike up a snow-covered hill provides staggering views. Iceberg filled waters, surrounded by the towering peaks of the continent will leave even the most jaded traveller lost for words. If the ice conditions allow, Zodiac cruising or sea-kayaking into the nearby ice ‘cathedral’ of Skontorp Cove is another memorable experience. On a still day, the dark water reflects the gigantic glaciers throwing a magical light over this ethereal scene. We navigate in a northerly direction along the Gerlache Strait overnight. This is an important whale migration corridor and with the long hours of twilight at this time of the season, we encourage you to be on the bridge looking for the tell-tale blows of the migrating pods of humbacks and minkes. We may even catch a glimpse of the resident orca pod that inhabit this stretch of water. By morning we have reached several other favoured locations in the northern Gerlache. Places such as Cierva Cove or Mikkelson Harbour allow for some great excursions on shore and in the Zodiacs. There are substantial penguin rookeries located here and it’s a good place to look for leopard seals on the icefloes. The remote Spert Islands provide a fascinating lesson in geology. The island group is criss-crossed by narrow channels and coves and cruising in the Zodiacs or sea kayaking here is a real thrill. Seabirds nest on the cliffs above, while seals can be found resting along the shoreline. We usually encounter whales in this vicinity. We continue our journey and by morning, will have arrived in the South Shetland Islands. Sunrise over Livingston Island is a sight to behold as the mountains are a blaze of colour as we arrive into the South Shetlands. We enter the McFarlane Strait with an objective of Half Moon Island, or nearby Yankee Harbour. Arriving on shore, a sizeable rookery of chinstrap penguins act as a very noisy welcoming committee and we hope to observe our first substantial elephant seal colony here. Additional locations we may visit include Fort Point on nearby Greenwich Island with its pebble covered isthmus – a popular location for resting fur seals. After a busy day in the South Shetlands, excitement is in the air as we set sail for Antarctic Sound – the gateway to the Weddell Sea. Arriving into the Weddell Sea is a humbling experience. We notice an increase in the huge, flat-topped tabular icebergs in this vicinity. We always anticipate exciting ice navigation in the Weddell Sea and watching the Captain and Officers at work is a lesson in skilled seamanship. The Weddell Sea is rich in history. The early Swedish explorer – Otto Nordenskjold and companions spent several years here in a remarkable yet little-known tale of survival. Just over a decade later, Sir Ernest Shackleton and the survival of his crew from the Imperial TransAntarctic Expedition (HMS Endurance), in 1914-17, grabbed the imagination of the entire world. To this day, Shackleton’s journey remains one of the great tales of polar exploration and survival. The region is home to immense colonies of the smallest of Antarctica’s penguin species – the Adelie. In locations such as Paulet Island, Brown Bluff, Gourdin Island and the Danger Islands, these rookeries are home to as many as 100,000 nesting penguins. If ice conditions permit, we push south towards the fabled location of Snow Hill Island. A known emperor penguin rookery can be found here. While the largest of Antarctica’s penguins nest far from the shoreline, all eyes are peeled on the waters and icefloes as we hope to view these superb penguins coming and going from their rookery. Our adventure is far from over and we have an exciting day planned with possible shore landings on Vega Island, which is home to some of the most fascinating palaeontology found in all of Antarctica. Fossils here tell the story of Gondwanaland, of giant penguins and other dinosaur species and early plant life on Earth. Brown Bluff and d’Urville Monument are other landing possibilities in the area. We celebrate our exploration of the Weddell Sea this evening, enjoying a fine Christmas celebration on board the ship commencing our journey home. Designed for polar research, this ship is modern, comfortable, safe and ice-strengthened. From small group sessions to briefings for all passengers, we have public spaces onboard the ship ideally suited for each and every need. A separate bar and lounge, as well as a library provide ideal places to sit and relax or catch up on some reading. A selection of movies and documentaries can also be watched in the lounge. Other facilities include the theatre style presentation room, gift-shop, fitness room, massage room, sauna and plunge pool. Designed and built as a scientific research vessel in Finland, the One Ocean Navigator is very stable, quiet and comfortable. Refitting and refurbishment over the last five years oriented towards her role as an expedition cruise vessel has greatly improved the comfort and calibre of the facilities aboard the ship. There is little if any ambient noise from engines or machinery and with most of the public spaces on a separate deck from the majority of the cabins there is little issue with passenger-generated noise. Vessel stabilization is gained through a combination of internal stabilizers and a built-in ballast trimming system. The rapid transfer of ballast between special trimming tanks reduces vessel motion and coupled with a modern hull design gives us a stable platform for science and exploration. Having undergone an extensive renovation in 2011 to expand the size and comfort of the bar, we have found the bar to be one of the best gathering places onboard. Located aft of the lobby on the main deck the bar is easily accessible to all passengers. With outside views through portholes and a door out onto the main deck, the bar is a comfortable place to enjoy a fresh fruit smoothie before breakfast, grab a bottle of water before an excursion or enjoy a cocktail before dinner. A stereo with MP3 player dock and a monitor showing live video footage of the view forward from the bridge at all times can be found in the bar. The ship’s bridge is located on Deck 6 and is open to passengers virtually 24-hours a day. The officer on watch and a helmsman can always be found on duty on the bridge and it is also the best place to meet the master of the vessel. The chart room is a fascinating place to visit and expedition staff or ship’s crew are often available to answer questions about the equipment and instruments found on the bridge. In addition, the bridge is an excellent place to sightsee and view wildlife from. Binoculars and wildlife identification guidebooks can be found on the bridge and during much of the day, an expedition guide will be watching for wildlife from the bridge. The ship carries all required communications and navigation facilities and equipment. An Iridium satellite communication system is in place for both voice and personal email use. Equipped with Inmarsat telephone and fax equipment as well as a variety of shortwave, SSB, and VHF radio systems, she also carries fully current GMDSS (Global Marine Distress and Safety System) equipment. With buffet breakfasts, buffet and/or plated lunches and plated dinners, the dining room can seat all passengers in one sitting. Attractively lit and comfortably furnished, it is served by our ship’s stewards and hosted by our Adventure Concierges. Our culinary team includes four chefs who are creative and outstanding in their commitment to quality, outstanding taste, and healthy preparation. To keep up to date with the view from the bridge, live streaming video can be viewed on a television screen in the dining room during meals. A small lounge can be found in the forward part of the dining room along with a small bar used during meal service. A lift (or elevator) services Deck 1 through 5, allowing access to and from the presentation room on Deck 1. The bridge and cabins on Deck 6 are not accessible by lift. Access to the zodiacs is by way of gangway stairs from the main deck (Deck 3). The gift shop carries a supply of souvenirs and sundries and is open most days of the voyage and can be opened at anytime for your convenience. From warm hats and gloves to polar books and t-shirts, the gift shop has something for everyone. In addition a small selection of toiletries and sundries can be purchased from the gift shop. Our onboard fitness program allows even the most dedicated enthusiast or those interested in starting a new regime, the opportunity to keep up or start their individual or group fitness. The fitness room onboard the vessel has a set of free weights, exercise bike and rowing machine. Exercise mats and balls are also available in the fitness room, as is a stereo with an MP3 player dock. With our registered massage therapist, fitness trainer, yoga instructor (on select departures) sauna and hot water spa, your mind and body will be rejuvenated and ready for either the next round of activities or a chance to curl up in a cozy spot in front of our fireplace. Having the option to start and end each day with healthy and whole food options, provide the base for your system to be running optimally. Located on Deck 5, the infirmary can cater to basic medical needs. Although containing an impressive quantity of medical supplies, passengers with pre-existing medical conditions requiring medication or supplies should come self-reliant. We will carry an English speaking emergency physician on every voyage. If there is a need to consult the ship’s doctor and receive medications from the infirmary, passengers will be invoiced for the cost of any items supplied. The library is located on Deck 5 and has wonderful forward viewing windows. A quiet part of the ship containing a large conference table, seating for about 18 and numerous polar reference books, the library is a great place to relax and learn about the region being visited. Just outside the library, there is additional seating in wingback chairs, another great place to sit and read. The library has a slide screen and whiteboard and is often used for small group focus sessions and discussions. Adjacent to the bar on the main deck, the lounge has a piano, television, board games and puzzles and is connected to our popular bar. Outside where a covered viewing and seating area is located you can enjoy the beautiful vistas of Antarctica. Be sure to take a cozy blanket with you from the lounge while you go out to sit and enjoy the view from the starboard side of the ship. A 24-hour coffee and tea station can be found in the lounge, which also serves as an overflow area for the bar during Happy Hour and for after dinner card games. Of course, what lounge would be complete without a fireplace? An expedition requires expedition gear and a place to keep it. Our passenger mudroom is the ideal spot to prepare for excursions and keep your gumboots and foul weather gear separate from your cabin. Shelves on the aft wall of the mudroom help in the storage of gumboots and a pegboard is in place for drying gloves. The mudroom is on the main deck, between the reception area and the bar and we use this direct access to outside for boarding the zodiacs via the gangway. Our presentation room can be found on Deck 1, the lowest and most stable deck on our vessel. With seating for all passengers and elevator access, the presentation room is equipped with theatre style seating and modern multi-media presentation system. The top deck enjoys 360 degree views around the ship. A great place to enjoy calm sea days and spectacular Antarctic scenery, the top deck also has a small observatory where a spotting scope is stored as well as warm blankets and a comfortable bench. Bring your travel mug with you to the top deck on pleasant afternoons and our Adventure Concierges will bring carafes of steaming hot chocolate or other hot beverages to you. Refill your travel mug as often as you like. Our multimedia room contains Apple Macintosh computers with the latest software for photo management and manipulation. External hard drives, a battery recharging station (110 V and 220 V powerbars for plugging in your charger), multi-card readers and a selection of cables for connecting various cameras to the computer can be found here. Manage your rapidly expanding polar image library, burn DVD’s or prepare slide shows to entertain fellow passengers or family at home. In addition we have available a portable 4”x6” photo printer to print out copies of some of your favourite photos. We do recommend that you bring your own recharger cables and download cables, as well as spare memory cards for your camera. After many years of careful planning, we are excited to feature this unique journey for the very first time. This expedition combines many of the classic and well-known locations along ......click here to read more. This voyage links numerous historic locations on Canada’s east coast, including a known Viking settlement, a French built fortress, several remote mission locations and isolated fishing ports. We journey from ......click here to read more. Love your outdoor pursuits? So do we! This wonderful Antarctic cruise spends 13 days exploring the pristine Antarctic wilderness in spring. The wildlife migrations have commenced and the sea ice ......click here to read more.